It is sad that parents are misinformed by those who are against vaccination. It is sadder still that children are not as healthy as a result. The saddest thing of all, however, is how innocent children suffer because of anti-vaccination misinformation. This year, we are witnessing the fruits of this misinformation: the suffering and death of innocent children. According to the California Department of Public Health, there have been 4,461 cases of whooping cough (pertussis) reported throughout the state so far this year. The majority of those are confirmed cases, but 19% are considered probable cases, while 18% are merely suspected cases. This is the largest number of reported cases since 1955. At least 217 of these cases resulted in hospitalization, and 9 resulted in death! What is causing this sudden surge of whooping cough? Well, there are actually two effects. First, like most contagious diseases, whooping cough goes through cycles of years when it is not very prevalent and years when it is very prevalent. This year is in the “very prevalent” part of the cycle. Second, over the past few years, there has been a significant reduction in the vaccination rate, due to misinformation promulgated by those who are against vaccinations. The following graph shows the incidence of whooping cough in California and the whooping cough vaccination rate during the same period. Notice how there are peaks and valleys in the number of cases due to the cyclic nature of the disease, but notice there is also a pattern of lower vaccination rates coinciding with higher numbers of whooping cough cases during the peak years. Now it is important to note that this graph by itself doesn’t tell us that the increase in whooping cough cases is the result of a reduction in vaccination rate. After all, it could just be a coincidence that whooping cough cases increased while whooping cough vaccination rates decreased. However, other data clinch the case. What are the other data? First, the United Kingdom experienced this exact same situation back in the 1970s and 1980s. In 1974, vaccination rates for whooping cough dropped, and over the next ten years, the number of whooping cough cases skyrocketed. When the vaccination rate increased to its pre-1974 level, the number of whooping cough cases went back down in response. When all these data are put together, the conclusion is clear. Because people in California are refusing the whooping cough vaccine in large numbers, whooping cough is rearing its ugly head there. Children are needlessly becoming sick and dying, and we have the misinformation spread by anti-vaccine people to thank for it. Dr. Wile, Thank you so much for a thoroughly evidenced article on the correlation between the disease pertussis and the lack of vaccination. I know there is a movement among some homeschoolers to reject vaccinations, and since their children do not have to get the required immunizations for entering public school it is easier to slip around vaccinations. Many people believe allergies and asthma are caused by early vaccinations. At least this was what I remember being told by moms in the homeschool circles. Of course, some even warned of death due to vaccines. But all this was before I became more educated through your science series and learned to seek empirical data that was well-studied by more than one source. Thanks, Lindy. A good review article that discusses several studies and shows that there is no link between vaccination and asthma or allergies can be found here. While a great fan of your Homeschool curriculum, I’m becoming more and more disturbed by your continued efforts to scare and promote the use of vaccines. Additionally, it appears you have continued to be a propaganda machine for “Big Pharma”. I am a mother to four children, have worked alongside researchers in the area of Genetics(MD, PhD, as well as an Analytical chemist, and I am befuddled by your continued disbursement of the Establishment’s propaganda regarding vaccines, vaccine safety and their efficacy. I am saddened to continue to read her on your blog this misrepresentation of the truth about vaccines. In my opinion, your selected studies you have quoted are all biased, as well as their references used in these two studies. Web MD clearly states; “Mercury is very dangerous to children. Relatively low concentrations keep a child’s brain from developing normally. Kids with mercury-poisoning have problems with thinking, language, memory, motor skills, perception, and behavior.” Additionally, Richard Weisman, MD, a toxicologist at the University of Miami School of Medicine and director of the Poison Control Center for South Florida stated, “There is no doubt that mercury is one of the worst [toxins affecting the brain].” Thimerosal a widely used preservative which as you are aware was given the name “Merthiolate” by its maker Eli Lilly. Merthiolate has been band in the US due to its side-effects, yet it appears that this same compound if believe to be safe…even in “trace” amounts in pregnant women, nursing mothers, and infants. Unfortunately, all four of my children have been vaccinated and injured by their childhood vaccines. My husband and I have been told by our son’s Doctor (who not only is a MD and a PhD in genetics from the George Washington University. He is a Fellow of the American College of Medical Genetics and is a Fellow of the American College of Epidemiology. Additionally he is board certified as a genetic counselor by the American Board of Medical Genetics, and is a Founding Associate Member of the American College of Medical Genetics and was board certified by the American Board of Forensic Examiners and was made a Diplomat of the American Board of Forensic Medicine.) that our fourth child’s (our only son) autism was due to the genetic predisposition that he has which was clinically found through a simple blood draw at a nationally used lab…LabCorp. No, there is NOT a genetic link, ONLY a predisposition. Our son inherited two different SNPs. These mutations are the C677T and A1298C both are significant in the detoxification pathway (Glutathione pathway). Our son has the inability to detoxify. Therefore, when he was in-utero and I received my mercury-laden single dose preserved Rhogam vaccine at 11.5 weeks of gestation, and a second one at the 28 week gestation time-frame during his pregnancy, (both contained the mercury preservative Thimerosal), these as well as most of his childhood vaccines that were looked up by their lot numbers to find that they too had the mercury preservative Thimerosal in them. He was developing perfectly normal, without any delays, hitting milestone after milestone…then WHAM…after his 14/15 month vaccinations…he began to slowly loose his eye contact, started to isolate play, disinterested in his sisters who were very close in age to him. (We had our four children all in 4.5 years. Our oldest is now 14 and our son is now 9.5 years old.) By the way…we were not considered ‘older’ in age as you state in your Biology book. We are now slowly pulling him out of the Autism abyss, and he is making great gains thanks to our Lord and Savior giving us guidance and direction in this journey. I was indoctrinated as you, I am an X-ray/CT technologist by trade, hold a BS in Health Education, and made to believe that vaccines are perfectly safe. If vaccines are so safe and effective why then is there actual evidence based on fact as well as legislation protecting the vaccine providers, and the vaccine makers? The National Vaccine Injury Compensation Program (NVICP) states a completely different reality. The NVICP is set up to pay individuals who have been effected or have died their families compensation. This is funded by the vaccines themselves…our tax dollars do not cover/support or contribute to this program. For every vaccine bought and administered, 75¢ goes directly into the NVICP to cover any possible damage occurring caused by a vaccine. So, why if vaccines are safe should there be a need for the NVICP to protect the vaccine maker, the healthcare provider from civil lawsuits? Also, if vaccines were truly effective why do States mandate the vaccination program…because if vaccines were truly effective then we all would be lining up for them . Regarding, what is truly in reality, the ‘herd immunity’ theory…vaccines as you know do not give the blanket immunity to those who have been inoculated with all the recommended vaccines that are given today. Our son and three daughters were mercury-poisoned by their childhood vaccines. They all have compromised immune systems. All have been genetically tested as well as my husband and myself. We all have the polymorphisms as I mentioned previously…we do not detox effectively. When you dump toxins in a child prior to birth, at birth, and every other month up to the age of 2 years of age, neurological disorders as well as immunological disorders occur. My family is not the only family out here in the populous stating what has happened to their perfectly normal developing child who finally received the preverbal ‘straw that broke the camel’s back’ vaccine that caused their immunologic system to go haywire and began to see its own body’s cells as foreign predators. It was obvious to Dr. Engley that mercurial compounds were ineffective as an antiseptic back in 1950, I don’t understand why it is even called a preservative when it has been shown to be ineffective as even that, but it has been shown in multiple studies as being effective as a neuro-toxin. No wonder with the “Flu Shot” being administered to women while they are pregnant and now on the infants and small children as well as the “H1N1” vaccine, that are mostly Thimerosal preserved to we see the continuation of the autism rates staying high. They replaced the Thimerosal that had been given to all four of my children while I was pregnant in the Rhogam vaccine ( a single-dosed shot…not needing a preservative!) with the “Flu Shot”. I personally asked for a 2009-2010 formula’s package insert last fall which read that the vaccine was a “Pregnancy Category C: Animal reproduction studies have not been conducted with FLUVIRIN®. It is also not known whether FlUVIRIN® can cause fetal harm when administered to a pregnant woman or can affect reproduction capacity.” Yet, OBGYN’s recommend this Category C drug to their pregnant patients…apparently not reading the package insert themselves. Additionally it should be noted, with the reduction of the Thimerosal in the childhood vaccines the Thimerosal being administered via the seasonal flu shot(s) and even the so called traced amount which is found in some of the childhood vaccines can still wreak havoc on a compromised immune system…the numbers of autism will not go down. I can only continue to pray that the American people will not put their faith in the “VACCINE GOD” but investigate for themselves, and wade through the biased “Big Pharma” propaganda that they are being bombarded with in the mainstream media, radio, and now even Christian-based Homeschool Curriculum and make their decision cautiously. Autism is not a fun thing to watch your innocent child have to deal with daily, 365 days of the year nor is it God’s plan. We live in a fallen world, and autism and greed is yet another reality of that simple fact. Dr. Wile, my family and I did enjoy you playing the piano at church last Sunday, September 26th…you are quite a talented man! We are sorry for my son’s outburst during the service prior to being dismissed to “Kick”riffic Church. He will sometimes do that…especially at the most quite times! Melissa, thanks for your comments. Unfortunately, you couldn’t be more incorrect. In fact, the studies I quote are not biased. They are generally done by those who have a vested interest in finding problems associated with vaccines. Thus, if there is any bias in these studies, it is an anti-vaccination bias. As I discuss here many of the SAME AUTHORS who found a problem with the old rotavirus vaccine (a problem that caused it to be pulled from the market) are on the studies that show no link between vaccination and autism. Why were these researchers supposedly “unbiased” when they found a problem with a vaccine but are now “biased” because they did not? The fact is, they are biased to find problems, as that’s when they are rewarded with larger research grants. Your discussion of mercury is an excellent example of how you are ignoring the science on this issue. I agree that mercury is a neurotoxin AT CERTAIN CONCENTRATIONS. If you remember your freshman chemistry, you should remember that there is no chemical that in and of itself is toxic. It all depends on concentration. Studies clearly show that the level of mercury in children due to vaccination is simply not toxic. This, of course, is why study after study show no link between vaccination and autism. While I understand how emotional your person experience has been, you need to remember your scientific training. Since lots of vaccinations occur, there will be coincidental timing between vaccination and some adverse effects. As I show here, for example, pure mathematics tell us that each year, there will be 46-47 SIDS deaths that occur in the same day of DPT vaccination BY SHEER COINCIDENCE. This is why it is so important to do studies to determine cause and effect. Our personal experiences often show us coincidences, which have no relationship to cause and effect. From my memory, I’ve known exactly one person involved in …a fatal car crash. I don’t remember how many people were involved, but he was the sole survivor. He was also the only one not wearing a seat belt. He was thrown clear of the wreckage. Everyone knows seat belts save lives, but not in every accident. Some people even die in some pretty minor accidents. And some people manage to survive…even walk away from…some pretty horrific crashes when they weren’t wearing seat belts. There’s even the odd case here and there where wearing a seat belt likely would have caused a fatality. Now if this person followed her personal experiences over the data, she would not buckle herself or her children up, which would put them at grave risk. Obviously, that would be a bad thing. Once again, the data are more important than our personal experiences, especially when it comes to medicine. You ask, “If vaccines are so safe and effective why then is there actual evidence based on fact as well as legislation protecting the vaccine providers, and the vaccine makers?” I am not sure what you mean by “evidence based on fact.” The evidence is in study after study after study that demonstrate both the safety and efficacy of vaccination. There is legislation protecting vaccine providers and vaccine makers because the courts don’t care about evidence. As a result, no one would make or distribute vaccines because our courts make judgements based on emotion, and those judgments make it impossible for some medicines to be made. Since the data clearly show how vaccines protect public health, legislative protections must be put in place. If our courts made decisions based on evidence, there would be no need for such leglislation. I urge you to actually look at the studies that deal with this issue, as you clearly have not. You appreciate my curriculum because I follow the data, not my personal experiences or my feelings. As a result, I am a young-earth creationist. Using EXACTLY the same scientific reasoning and commitment to the data, I am strongly pro-vaccine. There is really only one scientific position on this issue, and I urge you to stop quoting 60-year-old research and actually look at the modern studies that show the safety and efficacy of vaccines. A good summary of the mountain of data supporting vaccination can be found here. Your article and comments clearly show how clever you are as a vaccine apologist in proverbially “putting the handles on the pots that you throw wherever you want them to be”. For a different view, I would encourage you and those who read what you publish to read my latest commentary, “Vaccines, Vaccination Programs, and Knowing Misrepresentations” (see: http://dr-king.com/docs/101001_VaccinesVaccinationProgramsAndKnowingMisrepresentationsb.pdf), and provide me with the unbiased peer-reviewed papers that refute the science-supported statements made in that article. If you need any help, perhaps you can ask Dr. Steven Novella (snovella@theness.com), an MD and fellow clever vaccine apologist to assist you. THEN what is the relevance of “9 deaths” purportedly from pertussis or the cases of pertussis? If you want to understand the effectiveness of pertussis vaccination, then you must look at the facts in comparison to diphtheria vaccination, which takes place at the same time a DTaP or Tdap vaccine is administered. If the vaccination level (uptake percentage) were the real issue, then there should be a resurgence of diphtheria cases — BUT, as you know or should know, there has been NO resurgence of diphtheria cases even though, both are “notifiable diseases”, where a failure to report either carries criminal penalties. Factually, pertussis is a disease for which mass vaccination programs are unsuited (because: a) they create a significant of carriers of pertussis [“Pertussis Harrys”] and b), to the extent they suppress pertussis, increase the opportunity for other disease organisms (e.g., parapertussis) to be the disease occupying this biological niche). Because the pertussis vaccine is not in-use effective, other control approaches should be used. Besides encouraging long-term (2-plus years) breastfeeding from mothers who have near optimum levels of all vital nutrients, those control approaches should include the determination of and maintenance of optimum levels of vitamins (e.g., vitamins: A, the Bs (including Biotin), C, D-3, and K-2), minerals (e.g., magnesium, zinc, potassium, phosphorus, boron, and molybdenum) and nutrients; and the early detection of disease onset, prompt determination of the specific antibiotic susceptibility of the strain of disease detected and the treatment with the appropriate least-risky antibiotic to which the disease strain identified is susceptible. Hopefully, after reading the preceding and the recommended articles, you and your readers will, at a minimum, have a better understanding of reality. PS: In the last few years, measles and mumps outbreaks were the harbingers of disease resurgence and now it is “pertussis”. Why, other than because of vaccine apologist fear mongering, does the disease problem jump from disease to disease? Also, please disclose to the public how many of the 4,500+ cases of pertussis in California are occurring in fully vaccinated individuals — is it 2,000+, 3,000+ or 4,000+ or? And, if you do not know or that information is not available, then why not? In the last (2004-2005) California outbreak, most of the pertussis cases occurred in fully vaccinated individuals. Based on that reality, it would seem, if you want to misuse the numbers data, that getting the vaccine increases one’s risk of subsequently contracting “pertussis” — and the medical literature clearly establishes that being vaccinated for pertussis increase the number of “Pertussis Harrys”. Dr. King, you asked for unbiased, peer-reviewed literature that refute the irresponsible statements in your article. That is really easy. 1. Your article claims that vaccines are not safe, even though you cite no studies to back up the claim. All you do is say that the National Vaccine Injury Compensation Program would not exist if vaccines were safe. That, of course, just demonstrates your ignorance of our legal system. The program exists because our legal system doesn’t care about evidence. Whoever has the most emotional case wins. A tiny portion of the data that demonstrate vaccines are safe can be found here. 2. Your article claims that vaccine are not effective, even though you cite no studies to back up the claim. Once again, all you do is make specious arguments about there being “no need” for state mandates, etc. Because vaccines have been so effective at destroying disease, people don’t fear the diseases anymore, which allows misinformation like yours to scare them away from getting proper health care. A tiny portion of the data that demonstrate the efficacy of vaccines can be found here. 3. Your article claims that too many vaccines are given, which causes all sorts of problems for children. In this case, you finally cite ONE study, but it is simply an analysis of the VAERS, which specifically states, “In some media reports and on some web sites on the Internet, VAERS reports are presented as verified cases of vaccine deaths and injuries. Statements such as these misrepresent the nature of the VAERS surveillance system.” Thus, the “study” is nearly useless. For real studies that demonstrate that there are no problems with the number of vaccines we give today, go here and here. 4. Your article claims that vaccines have not stopped the vaccine-preventable diseases, but sanitation has. Once again, you cite no studies to back up this absurd claim. You can go here to see not only that sanitation was responsible for the INCREASE in polio in the 1940s, but also that sanitation cannot explain the drop in vaccine-preventable diseases. 5. Your article once again tries to claim that legal issues somehow cast doubt on vaccines. Once again, our legal system doesn’t care about evidence. 6. Your article claims that there is no scientific proof that the influenza vaccine protects most of those who are vaccinated. That is, of course, nonsense. In a double-blind, placebo-controlled trial of the flu vaccine, for example, 1,602 children were given a flu vaccine or placebo. Vaccinated children were 13.6 times less likely to catch the flu than those who got the placebo [Belshe RB, et al. “The efficacy of live attenuated, cold-adapted, trivalent, intranasal influenzavirus vaccine in children.” N Engl J Med. 338(20):1405-12, 1998]. That study was expanded to a second year for 1,358 of the children and, in addition, 4,561 adults were added to the study. Once again, those who received the flu vaccine were many times less likely to get flu than those who received the placebo [Belshe RB, et al. “Safety, efficacy and effectiveness of the influenza virus vaccine, trivalent, types A and B, live, cold-adapted (CAIV-T) in healthy children and healthy adults.” Vaccine 19(17-19):2221-6, 2001]. Even in the elderly, the flu vaccine is very effective at preventing illness. According to a meta-analysis done on flu-related data in seniors, the flu vaccine reduced mortality rates in people 65 years and older by 50% [Vu T, Farish S, Jenkins M, Kelly H. “A meta-analysis of effectiveness of influenza vaccine in persons aged 65 years and over living in the community.” Vaccine 20(13-14):1831-6, 2002]. I do thank you for linking your paper, however. I encourage everyone to look at it and compare it to my posts on vaccines. You will clearly see who is relying on data and who is relying on propaganda! Vaccination doesn’t cause 8,000 – 9,000 deaths per year. Once again, you cite no evidence for such a nonsensical claim, and that’s because no such evidence exists. Indeed, studies show that vaccines are very safe, as shown in the link above. I also appreciate you linking your draft paper on the whooping cough epidemic. Once again, the data are very clear. 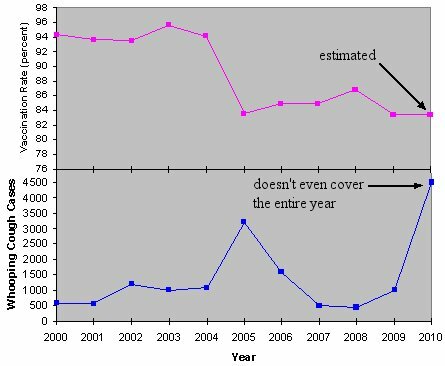 All you have to do is look at the graph in this post to show that 2010 is the worst year in recent times for whooping cough in California, and the data discussed in the post clearly show that it is the result of a drop in vaccination rates. Your paper’s attempts to deflect these obvious conclusions once again demonstrates who is involved in propaganda! The pertussis vaccine is quite effective, as demonstrated by the 2009 study discussed in this post that shows children whose parents refuse vaccination are 2,300% more likely to get whooping cough than those who are vaccinated. Once again, I do encourage everyone to look at Dr. King’s links. They show how little the anti-vaccination arguments are based on evidence. Thanks for your effective demonstration of that, Dr. King! I do apologize if you spent the morning away from church so you could state how you believe you are correct and I am incorrect, and how you ‘believe’ that I aloud my emotions to get in the way of what you are convinced to be true. I’m aware and know how to determine if a study is “biased” or “unbiased”. Due to my unfortunate thrust into the autism abyss and my son’s (and my daughter’s) mercury poisoning I have gleaned through quite a lot of studies and yes, have read those that you even believe to be unbiased. I do wonder Dr. Wile, had I not mentioned my own personal experience with our son’s atrocity…what would your response had looked like then? I had brought up several facts that you did not address in your attempt of intimidation in your last post. First, you never made a comment regarding the FlUVIRIN® package insert, yet you dismissed my study that, yes, while it is over 60 years old, is perfectly up-to-date with its data. Nothing in that research is “out-dated” as you suggest due to it being over 60 years old. Merthiolate is no longer used over the counter, but yet as Dr. Engley stated, it is an ineffective preservative. One can go to Wikipedia and see the definition of Thimerosal, that Eli Lilly manufactured and it was once called “Merthiolate”. Why then is it still being used in vaccines when it has been shown to be ineffective as a preservative in this ‘old study’? Second, what I find disturbing, is your continual twisting of the science you relish in and say that I am ignoring the science on this issue. You are a Nuclear Chemist, yet you have dismissed or maybe better stated…trivialized the fact that Thimerosal is toxic at parts per billion! Yet, you make light of that simple reality to your readers when stating “AT CERTAIN CONCENTRATIONS” in your response to my post. Here; (http://mercury-freedrugs.org/docs/050821saveof_200x_BoydEHaleySlidesOnGenetic&OtherAggravatingFactors-HgPoisoning.pdf ), is a very simple presentation given by a fellow Chemist. Hopefully after you and your readers read through it the simple truth will be obvious. If not, here ; ( http://mercury-freedrugs.org/docs/090812_fnldrft_TheTruthAboutTheToxicityOfThimerosalr5b.pdf) is yet another explanation of the toxicity of Thimerosal from another chemist…actually he is an Analytical Chemist. Regarding the mandated vaccinations… you are incorrect. They are just that…they are mandated by law. Look it up. Yes, I am fully aware of the “options of opting out”. I know. We have utilized this option when our children were being publically indoctrinated in the public school system. In our state of Indiana we actually have 2 options, the “Religious”, and “Medical” exemptions. I would advise your readers to use the Religious exemption. (It’s called an exemption due to the fact that the vaccinations are indeed MANDATED.) They do not need to state their religious affiliation, but only state that it is against their religious beliefs to vaccinate their child(ren). The state can do nothing to revoke that exemption here in Indiana with this particular mandate. Now, some states do actually have the “Sincerity test” where they will actually see if you are attending your place of worship etc… If your readers would utilize the “Medical Exemption” option, allow me to warn them that it can be revoked by the “state” ran school if they have their “State funded” specialist/doctor deem it to be an invalid reason. Religious exemption is always best. Therefore when I questioned why, if indeed the vaccines are so effective, the general public would not need a mandate to make them vaccinate, they would be willing to throw their child(ren) to the “Vaccine God” without anyone or you for that matter to be on a ‘soap box’ shouting your indoctrinated beliefs that vaccines are “Effective” and safe. As I mentioned previously… we all would be lining up for them. Unfortunately, this is exactly what the pagans the bible speaks about did by making their children “pass through the fire”. They sacrificed their children to a metal idol that had its arms out stretched over an intensely hot burning fire causing the arms of the idol to be red hot. This sounds all too familiar. Maybe you could tell me Dr. Wile what are the rates for the autoimmune diseases since the increase of the childhood vaccine program? Do you have any recent research showing that data? Please find here (http://www.ane.pl/showarticle.php?art=7021) another study for you and your readers to read, and hopefully, better understand the “spin” that has been going on with the “Vaccine God” worshipers and those of us who have realized the truth regarding the vaccines and their safety. Another question I have for you Dr. Wile, have you ever heard of the Simpsonwood Conference? I encourage both you and all of your readers to go here (http://medicalveritas.com/manBlaylock.pdf) and read more regarding how the government realized how they had a “Dragon by its tail” and what they did to do their best to bury it. Sadly, there was only one child saved from that meeting… the first born grandson of Dr. Johnston . He understood the true data and called his son and daughter-in-law during the meeting to prevent his grandson from receiving any Thimerosal-containing vaccine! Additionally, here (http://mercury-freedrugs.org/docs/Enclosure5_Emails.pdf ) you will read the actual emails sent to and from the researchers involved in the whole cover-up! At last, this link (http://mercury-freedrugs.org/docs/Enclosure1_AARHusUniversitet_Statement.pdf) you can read where the Aarhus University gave their statement regarding Dr. Poul Thorsen. I do pray that you and your readers will read through the items I have attached so that you might be more diverse in your thinking and not so closed minded and dogmatic. Dr. Wile, when I read your reply post(s)…it sounds all too familiar of others who get paid to promote vaccines. Your “speak” sounds very familiar just as those with a “vested” interest with Big Pharma. Such as the Insel brothers, and Dr. Paul Offit (maker of the Rotavirus…yes the one recalled and then reissued!) to name a few. I am puzzled why you feel it so necessary to come into the homeschool community for no other reason other than to publish this sort of indoctrination. As I mentioned in my previous post, your discounting of my research is exactly what you have said your mentor and professional peers did to you regarding the truth about the Young Earth. Quite honestly…you have no ‘understanding how emotional’ my personal experience has been, you could only imagine you have an understanding. Actually, it was due to my ’emotional connection’ that I learned the truth by digging through and researching for reasons and then finding them through my none other than my “scientific training” and I will not stop continuing to spread the truth of my findings. A fellow seeker of real scientific truth! Melissa, I did not miss church to refute your post. It took very little time. I sat up front with my wife, who was on the worship team. You clearly do not know how to determine biased studies from unbiased studies, as the material you have linked in this comment is not only incredibly biased, it is incredibly false! Had you not mentioned your personal experience, my response would have been roughly the same, since your position goes against the scientific facts. I didn’t mention your comments on FLUVIRIN, since it is not relevant to this discussion. That is a vaccine for the flu, and it should not be given to pregnant women. Your experience seems to indicate the incompetence of individual physicians, not the validity of vaccination. Once again, if you would actually look at the data, you would find that most of your statements are simply not correct. 1. DIRECT MEASUREMENT of mercury in children after vaccination shows concentrations that are not toxic. 2. Study after study shows NO LINK between vaccination and autism. Your second link is no better. It is by Dr. King, who I have already shown in another comment to be wrong on vaccination issues. In addition, it is based on a study that is almost 40 years old. It is not surprising that you are forced to rely on old studies to spread your misinformation, since modern studies show quite the opposite of what you want others to believe. You admit that I am right about no state mandates by explaining the exemption clauses, and then you try to claim that means I am not right. The very fact that you do not have to be vaccinated means there is no mandate. Indeed, you don’t even have to file exemptions if you do not want to attend public school. That clearly means there is no mandate. You did, indeed, mention previously that there would be no need for mandates (which you admit don’t exist) if vaccines were safe and effective, and I showed you how illogical that statement is. Since vaccines have done such a great job of getting rid of childhood diseases, misinformation like yours can easily fool people who do not have much experience with the deadliness of childhood diseases. All it will take to fix that is for vaccination rates to lower enough to produce piles of dead children, and then people will once again see the need for vaccines. I truly pray it doesn’t come to that, but misinformation like yours certainly makes such an outcome more likely, as California is already demonstrating! I can see that you are reading a lot of anti-vaccination information, since you make the false claim that autoimmune diseases are linked to vaccination. A quick look at the medical literature shows such a claim to be false. Just look here, here, and here. I am very well aware of the 2000 Simpsonwood CDC conference, and I am aware of the misinformation the anti-vaccine people have produced regarding it. The article you link is a perfect example of such misinformation. It claims the meeting was held in “secret.” That is, of course, 100% false, as are most of its other claims. An excellent analysis of the many falsehoods in your linked article can be found here. While the blog is in reference to the nonsensical piece that appeared in Rolling Stone, it applies equally well to the article you linked. The update at the bottom is particularly valuable, as the article you linked mine quotes and presented them out of context, just as the Rolling Stone article did. This shows how committed to falsehoods some anti-vaccination people are! I see that you also can’t resist some conspiracy notion, trying to link me to people who “get paid to promote vaccines.” I don’t get any money from anything I write here. It is sad that you have to try to reach for such conspiracy nonsense instead of simply looking at the facts related to vaccines. I am not discounting your research. I am stating exactly why it is incorrect. That’s what my mentor and professional peers could not do, but anyone with a passing knowledge of medical research can do when it comes to your incorrect statements about vaccines. I agree that your emotional connection is probably what led you to what you think is the “truth.” As I mentioned to Ben, emotion clouds judgment and allows you to be swayed by misinformation. I will not allow that misinformation to be spread here, however. That is why I simply counter it with the facts. I pray one day that you actually become a seeker of real scientific truth! Not sure if anyone already mentioned this- I didn’t read all the above comments. At least 5 of those infants who died were under 2 months of age. They were under the age of even getting their first Dtap shot. Denise, 8 of the 9 deaths were for children who did not receive the first DTaP shot. However, that is the case every year, and you haven’t seen this many cases or deaths before. The reason these poor children were exposed to whooping cough to begin with was because vaccination rates have dropped to the point that their risk for exposure has gone up considerably. The article you link that states the vaccination rate is 98% gives no reference for that statistic, and it is quite wrong. The data from the graph come from the National Immunization Survey, which is an actual study. Thus, they are the correct data when it comes to vaccination rates for the DTaP. Found it interesting that this article mentions 98% of the kids in California have received 3 doses of DTaP by the age of 19-35 months. It doesn’t sound parents not getting their children vaccinated is the problem- at least not in California. Especially if the deaths occurred in children under the age of receiving their first dose, and the appropriate aged ones are receiving their shots (at least 98% of them). Why on earth are vaccines even being treated like an issue? 1. There are some people who benefit from making others distrust modern medicine. Some naturopaths, nutritionists, chiropractors, etc., will make more money if they can convince people modern medicine is bad and that they should use “alternative medicine” and “supplements” instead. Now let me make it clear that not even a majority of naturopaths, nutritionists, chiropractors, etc. are like that. Most of those practitioners consider their practices to be complementary to modern medicine, and there is validity to that claim. A good view of health care would consider such services in addition to the services of board-certified physicians. 2. There are a lot of people who love to claim that they have some “hidden truth” that is not understood by most other people. This makes them feel superior, and in general, if they can make their arguments sound convincing, they can create a following. Remember the Y2K alarmists? Their ideas held no more water than the anti-vaccination ideas, but they garnered a non-insignificant following. I think most of them fit into this category. Another group that fits into this category is the “We never landed on the moon” group. Their claims have no more validity than the anti-vaccination claims, but they are popular among some people. 3. I think the biggest reason is that a lot of people see the failures of modern medicine and become emotional about it. Emotion clouds judgment and allows you to fall prey to misinformation. Consider the parent whose child has autism. Because we are still rather ignorant about this syndrome, modern medicine provides no warning for it as well as precious little treatment once it happens. A despondent parent, therefore, searches for something or someone to blame. He or she reads anti-vaccination misinformation on the internet, and it appeals to his or her emotional state. Read Dr. King’s first link, for example. It is filled with emotion, not facts. It is designed to make parents angry, and anger is easier to deal with than grief. As a result, such parents become convinced of the position, despite the fact that it is easily refuted by even a casual look at the data. Another way to look at this group is to see how successful some political organizations are when it comes to demonizing their opponents. It is easy for a poor person to get mad at rich people, since rich people have more, and in the mind of some poor people, they don’t deserve it. A political organization can take advantage of that and create quite a following by demonizing the “evil” rich people. Thank you for pointing me to the National Immunization Study. Very interesting, I had not heard of this controversy before. I don’t think that the majority of Homeschoolers are against vaccination per se. But like us, are against enforced vaccination. Jonathan, you are right. The majority of homeschoolers look at the evidence. They are also against forced vaccination, as am I.
I am sad to say I wish I had not found this blog. Mr. Wile, you seem to sound so arrogant and sometimes simply rude in your responses to people. I am a fan of debate, but I can’t understand how a Christian can respond so rudely. Everyone will not agree, and some will even use ridiculous arguments, but everyone can respond graciously. It seems to me you enjoy trying to humiliate and intimidate others. Go ahead and chastise me. I won’t be commenting again. Denise, I am sorry you feel that way. Jesus didn’t worry about being rude when He cleansed the Temple, and he certainly didn’t worry about being rude to the Pharisees. When the issue is important, the facts need to be asserted strongly. I cannot think of many things more important than saving the lives of innocent children. After reading these comments, I see both sides…and I agree essentially with Mr. Wile that it makes a lot of sense to trust in evidence, facts, and unbiased studies than going on the web seeking information that supports our predisposed bias. I find that one problem with automatically believing everything that these pharma companies say, however, is that the trust has been broken by the medical and pharma organizations who HAVE given false evidence about certain issues in the past for the sake of promoting pharma drugs and whose primary gain is monetary. You cannot tell me it is not true. We all know that power and money corrupts, and that while there are many honest, sincere, and reputable people doing these studies, there are also very corrupt heads in these organizations. Indeed, not all their studies or evidence is false, and it could very well be that the studies and the evidence you have mentioned are veritable and trustworthy. I’m not suggesting it isn’t. But more and more people, including myself, find it difficult to “trust” doctors, the pharma companies, and medical establishment in general. And no, I did not get my info from naturopaths or other biased people, telling me to distrust these organizations. It is true that there are corrupt people who are anti- vaccinations as well, and many people exist who have their own ulterior motives for promoting this information. A little error mixed with the truth, fed by the flame of emotion and grief, definitely can create bias. But how DO we know what is truth and error, aside from spending considerable time in comparing factual studies and the medical research articles or participating in them ourselves? You have prompted me to look into this issue further, as we did not vaccinate our children. After reading exactly how vaccines work on the immune system, I was very skeptical exposing my babies to that. They are 10, 8, and 6 now and very healthy, for which I am thankful. I am not disputing what you say about the efficacy of vaccinations, or that there is much anti-vaccination misinformation. It certainly abounds across the internet. But I am not completely convinced yet… Sometimes it takes real discernment to know which information is true and which is false. I shall endeavor to seek out real evidence that supports the claims, whichever “side” it’s on. Thank you for honestly presenting this article. I am open to further discussion, and would be interested to know what you believe about homeopathic vaccines? Are they a hoax? I haven’t looked into it much, but a friend has used them. Susan, I absolutely agree that you can’t believe anything the pharmaceutical companies say. Their only motivation is profit, so it is very possible for them to lie in order to keep the profits rolling in. However, none of the studies that I cite come from the pharmaceutical companies. Instead, they come from medical scientists who have a vested interest in finding problems with medicines. When they find problems, they are rewarded with bigger research grants. For example, the authors on the study that got the old rotavirus vaccine pulled from the market became the “go to” scientists for vaccine-related research. They never had to worry about grant money again. So these studies are done by just the people I want doing studies – those who WANT to find a problem. I agree that you should not trust doctors just because they are doctors. Indeed, there are some doctors who are ignorant enough of their own field to believe the anti-vaccination misinformation. You trust a doctor by building a relationship with him or her. Without a relationship, you must constantly check the doctor’s facts. You ask, “But how DO we know what is truth and error, aside from spending considerable time in comparing factual studies and the medical research articles or participating in them ourselves?” Actually, it is easier than you think. Just read both sides. Indeed, before I knew much about vaccines, I was ready to believe that they were unsafe and/or ineffective. To find out, I read the anti-vaccination side and compared it to the medical research. This showed me how untenable the anti-vaccination argument is. For example, look at a few of Dr. King’s links in his comment, or look at Melissa’s links. Then compare them to my discussions on vaccines, or other reliable sources. You should be able to see who is relying on evidence and who is simply trying to scare people. I am glad that you are interested in looking into this further. That is the only reason I present the information – so that people can educate themselves. I think the comments of the anti-vaccination people on this post demonstrate how afraid that makes them. I have not done a lot of research into homeopathic vaccines specifically, so I cannot cite studies about them. As a chemist, I think the underlying assumptions of homeopathy are incorrect. When you dilute something so much that no molecules of it are left in the sample, I don’t see how it can possibly have any effect. My family delays vaccines, and don’t get all that are recommended. I have two questions about vaccines that until are answered with thorough research backing up those answers will prevent me from getting on a traditional schedule. Why are the various preservatives and metals perfectly safe to inject into my body but yet, I shouldn’t eat those same preservatives? There is a lot of aluminum in many of the vaccines, and I can’t find any studies that show it is safe in such large quantities. My second question is why does my 8 lb baby and my 160 lb hubby get the same amounts of those metals and preservatives shot into their body? This makes no sense to me. I cannot stand going to anti vaccine sites because I do feel they throw scare tactics in their info, but it seems the pro vaccine sites do the same thing. And so people like my hubby and I are in limbo…not comfortable with vaccinating. Not comfortable with not vaccinating. Would love to hear from you! Jenn, the issue with metals and preservatives centers around concentration and elimination. No chemical in and of itself is toxic or healthy. It is all about concentration. Vitamins A, D, E, and K, for example, are healthy in low doses and toxic in high doses. Mercury, for example, is safe in low doses and toxic at high doses. When you eat something with mercury in it, that one meal isn’t going to cause a problem, because even in mercury-laden fish, it simply doesn’t have the concentration necessary to produce toxic effects. However, since we eat a LOT of meals, over time, eating meals with small amounts of mercury will build up the mercury in your body to the level that it will become toxic. Thus, you should limit your meals of tertiary predator fish (like tuna and king mackerel) simply because you eat so many meals that you can build up to toxic mercury concentrations. Compared to meals, you get very few vaccinations. In addition, the amount of mercury in vaccines is incredibly low. As a result, you simply cannot build up to toxic levels through vaccination. The other issue, as I mention above, is elimination. Some forms of dangerous chemicals are more easily eliminated from your both than others. Keeping on the topic of mercury, elemental mercury is hard to get rid of in the body. The mercury that is in fish (methyl mercury) is easier to get rid of in the body, but because it enters the bloodstream slowly (it must be digested first), more of it is retained than if the same amount was injected into your bloodstream. For the vaccines that contain mercury, the form is ethyl mercury. It is even easier for your body to eliminate than methyl mercury, and since it is injected into the bloodstream, it is eliminated more efficiently than if it were eaten. This is why direct studies of infants who are immunized show no toxic mercury levels. Of course, the best way to see that vaccines are not producing toxic effects is to look at the studies that assess general health. The fact is, vaccinated children are measurably healthier than unvaccinated children. You can see the results of such studies here and here. In general, the adult dose and the infant dose are different in vaccines. For the Hep B vaccine, for example, the adult dose is twice the infant dose. It depends a bit on the brand, etc., but in general, the dose is determined by what produces the appropriate immune response. A vaccine isn’t worthwhile if it doesn’t produce the necessary immune response. I understand the fact that you don’t like scare tactics, and I do think the anti-vaccination people specialize in them. However, I also think the importance of vaccination needs to be stressed, and part of what you need to learn is the potential consequences of not vaccinating. California is showing some of those consequences right now, as this post indicates. However, if you peruse my main vaccine post, you will mostly find science, not a lot of scare tactics. There is one word you used over and over again in your article and in your replies: ‘coincidence’ . Isn’t it ironic that, ‘coincidence’ is the exact word Evolutionists are using over and over again as proof of their believe. Linnie, the difference is that in the case of vaccination, we have direct mathematical analysis, and that analysis is confirmed by the data. In evolution, we have no mathematical analysis, as we have no way to even assess the likelihood of such coincidences. The fact is that coincidences occur, and to ignore the plain results of mathematics is not a rational approach to any issue. You might also want to read this article, which discusses your implication that the science behind vaccination is equivalent to the science behind evolution. Of course such a statement is simply false, because the science of vaccination is backed up by repeatable experiments, while the science of evolution depends on one-time events that cannot be repeated and thus cannot truly be analyzed. Dr. Wile, I think that you present your position (which you say is the position of science) as unnecessarily strong nad more importantly unnecessarily broad. For example you have claimed to be (and that science is) pro vaccine. However you CERTAINLY would not advocate administering vaccines which have been demonstrated to be dangerous, such as the rotavirus vaccine. Likewise you present vaccines as though they were completely safe, which is of course untrue. No medication is in itself completely safe, and risks are escalated still further by conflicts in other medicines, foodstuffs, or quirks in the particular chemistry of the patient’s body. That is why the vast majority of medicines have some side affects. For example some vaccines do make people momentarily unwell simply because they contain live (weanened) versions of the pathogen in question. Nevertheless if the liklihood of sideaffects and severity of sideaffects is significantly less than the lessening in liklihood and severity of the illness then the medication should be prescribed and taken as prescribed. That includes all major vaccines recomended by the health board today. I wouldn’t dare quibble with your broadbrush point but perhaps a little more compromise (or rather precision) might be in order. Josiah, I don’t know where you got the idea that I would even consider advocating a vaccine that has been demonstrated to be dangerous. For example, I remarked favorably about the fact that the scientists who found the problem with the old rotavirus vaccine were rewarded for exposing the problem. Obviously, I would never suggest using a vaccine that is known to be dangerous. I also do not present vaccines as though they are completely safe. Indeed, I have a whole page dedicated to the REAL side effects of vaccines. What I do say (and science is quite clear on this) is that the risks of not vaccinating far exceed the risks of vaccinating. Thus, while nothing is completely safe (people die each year taking baths), it is significantly safer to vaccinate than it is to not vaccinate. Dr. Wile, We’ve moved to presuppositional science within large swaths of the Christian community, and it’s growing. We’ve been taught that atheistic scientists are rigging the outcomes when it comes to data around the age of the earth, common descent, etc. We can find all the pseudo-sources we want on the Internet to support our presuppositions and can remain in our Christian bubbles without being forced to interact with conflicting data. We’ve cast down the idolatry of the “scientific expert” and have elevated our own biases. Is it a surprise that we now turn our guns on something that has done, by God’s grace, an immense amount of good like vaccines? Mike, that is an excellent point. It is amazing how people can be turned away from serious evidence simply by someone demonizing the scientists who collect the data. Dr. Wile, I believe you are completely correct that this issue is emotion driven. When my two oldest were very young, the daughter of a local TV personality died from chicken pox. Yes, chicken pox. I was worried. Years later, I was anxious for my third son to get the new chicken pox vaccine as soon as possible. This was before vaccines became such a controversial issue. I often feel like the only homeschooler who is not “educated” against the dangers of vaccines. Kathy, back in 1999 the homeschool community was abuzz with the idea that Y2K was going to be the end of the world as we know it. I am not implying that the majority of homeschoolers believed that, but a vocal minority certainly did. When I made a public post on my former company’s website saying that Y2K was not going to be a problem at all, I was inundated with angry hate mail from my fellow homeschoolers, telling me that I was ignorant of the issue, accusing me of being a paid operative of the power companies, and accusing me of not really being a Christian, but just masquerading as one. I see the anti-vaccination movement to be the same as the Y2K hysteria movement. They have been convinced by poor research and false information into believing something that is demonstrably false, and yet they accuse others of not being “educated” on the issue. I don’t know where in my post you got the idea that I thought you’d advocate prescribing a dangerous vaccine. I meant only to show that taking a line as completely pro-vaccine doesn’t work, a point you’ve agreed with. I agree that for administered vaccines the ballance works out positively, but your responses to the above comments didn’t seem to represent that sensible moderate line of looking for such a ballance. Josiah, you said, “However you CERTAINLY would not advocate administering vaccines which have been demonstrated to be dangerous, such as the rotavirus vaccine.” Later on, you claimed that I present vaccines as “completely safe.” Putting those two statements together led me to believe you were saying, “You are advocating all vaccines, regardless of safety.” Of course that is not true, especially because I devote an entire page to the REAL side effects of vaccines. Please note that it was the OLD rotavirus vaccine that had a problem. The new one appears to have no side effects other than irritability, temporary diarrhea, and vomiting. My responses to the comments were in answer to the specific statements in those comments. They didn’t appear to be moderate because the supposed problems that commenters brought up were demonstrably false. As a relatively new member of the homeschooling community, I’ve been quite surprised at the anti-vaccination sentiment. My education and occupational background is in molecular biology and so I have tried to have discussions with people, but they don’t even seem to want to talk about it. I do try to walk carefully through any open doors I find. I appreciate the information you have compiled on your blog, I have forwarded it to a couple of people with whom I am discussing the issue. Shevrae, I am glad that you are forwarding the information on. I have found that people who are honestly looking for answers appreciate it. Even though there are definitely some anti-vaccination advocates in the homeschooling community, most of the anti-vaccination people in the homeschooling community have simply been fooled by misinformation. If you give those people serious, reliable information, they will make a good decision. Dr. Wile, this website is invaluable, and I greatly appreciate your research and time invested in compiling this wealth of information on vaccinations. It is so refreshing to see arguments based on facts and proven studies, and not articles that promote opinions as facts, as are so prevalently found on the internet. I want to encourage you and others to keep fighting the anti-vaccination sentiment with truth and factual evidence. Like Shevrae, I have had discussions with some in the homeschool movement who are completely closed to considering the facts, and instead let either fear or a desire for control dictate their decisions. Many of them seem to think vaccination is a personal decision that has no effect on anyone but themselves, which of course is far from the truth. One thing I have learned in these discussions is how important it is to heed Colossians 4:6– “Let your speech always be gracious, seasoned with salt, so that you may know how you ought to answer each person.” Yes, I couldn’t agree more that “When the issue is important, the facts need to be asserted strongly.” That is certainly necessary. However, I believe there is a difference between an infallible person talking with nonbelievers (as Jesus did to the Pharisees) and a fallible person talking with fellow-believers (as Paul did to the recipients of his epistles). As important as vaccinations are, they pale in comparison to our salvation and other essentials of Christian faith which should keep us strongly united. Your and Melissa’s conversation could have benefited from a little more graciousness, without compromising the truth. Again, thank you for these articles and your commitment to speaking truth. Please keep at it. in his book on vaccinations. Are there recent studies that have address this issue? I realize that most of the studies that he cites pertain to premature infants or people with impaired kidney function, which does not correlate to healthy children and adults. Thus, Dr. Sears’s statement is quite wrong. Studies have been done specifically on aluminum in vaccines, and the evidence is that the only “danger” associated with aluminum in vaccines is more redness at the injection site.